Cattaneo Bros. 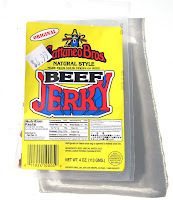 Beef Jerky is a brand of Cattaneo Bros., Inc. of San Luis Obispo, CA. The brand started out in 1947, founded by William Cattaneo, as a beef jerky manufacturer and stayed the course ever since. The business today is run by a different family, not related to the original Cattaneo founders, headed by Mike Kaney. 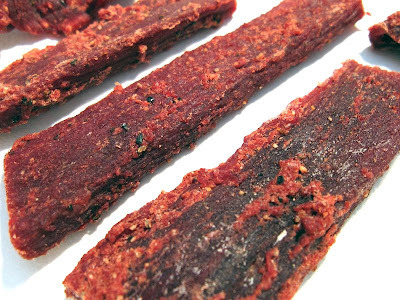 The brand includes three different lines of beef jerky, their "thin cut", a "cowboy cut", and this thick cut. Each of those cuts have their own variety of flavors. They also do turkey jerky and meat sticks. Their jerky is found in stores throughout central California. Beef, vinegar, water, salt, spices, garlic powder, sodium nitrite. The first thing I taste off the surface of these pieces is a slight saltiness, and a faint tanginess. In the chewing, the flavors I pick up is a bit more saltiness, and a light natural meat flavor. 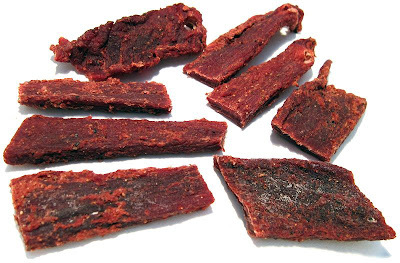 The overall flavor intensity of this jerky is light to medium, with some pieces being light, and others medium. The saltiness seems to be the primary flavor of this jerky from the surface flavors all the way through the chewing. It's a light-to-medium intensity. I can also sense the vinegar. That's probably what creates that slight tanginess from the surface flavor. But I can also taste it inside the meat. Overall, I think it does provide a dominant flavor for this jerky, perhaps second to the saltiness. But it might be nice to think of it as a salty-vinegar flavor, similar to what you might find those "salt & vinegar" flavored potato chips. The natural meat flavors are only slightly noticeable. In fact, you probably won't even notice them during most snacking. Overall, what you're going to taste in this jerky is a light saltiness, and light tanginess off the surface. In the chewing, you'll get a "salt & vinegar" flavor throughout, and that's mostly it. These appear to be slices of whole meat, sliced thick, and in small pieces. This seems to be a dry jerky mostly, but there's a semi-moist feel on the surface. Any amount of bending with the grain causes a piece to crack open and reveal cottony white fibers inside. These pieces are very tough. Tearing a piece apart with my fingers require a great deal of effort, while chewing is also rather tough and chewy. The chewing texture starts out quite thick and stiff, and has some rubbery-resistance. I can't really chew it at this point, as it requires some sucking to soften it up. From that point, it takes about 30 seconds of chewing until I can get it down to soft mass. Along the way, the salt & vinegar flavors leach out and provide some nice reward. Once it's chewed down, it ends up with a steak-like feel, similar to well-done. But by this point, the flavor has all but leached out. I note that other pieces tend to feel more like pot-roast, but not nearly as soft and juicy as pot roast. These pieces seem very lean, I found no traces of fat, and no tendon or gristle. However, I did encounter some chewy sinews inside the meat, but not too much. It's also fairly clean eating, with no residue picking up on my fingertips, and hardly any fragments falling off as I tore pieces apart. I paid $6.99 for this 4oz package at a Copenhagen Liquor store in Solvang, CA. That works out to a price of $1.75 per ounce. For general jerky snacking purposes, at this $1.75 price per ounce, it presents a fair value. I get an average amount of snackability from this, it has a nice flavor, albeit low-to-medium in intensity, but that tough chew makes it hard to snack on, and tires my jaws quickly. This Thick Cut Original variety from Cattaneo Bros. provides a tasty "salt & vinegar" flavor that I enjoyed quite a bit. But it's flavor intensity was not as high as I would wanted it. Each bite yielded enough flavor to enjoy, but not enough to satisfy my snacking urge. These pieces are very tough, and that made it difficult to enjoy the flavor, and ultimately tired me out. Based on the toughness of this jerky, compared to its low-to-medium flavor intensity, I get the sense that my jaws end up doing a lot of work but yield only small amounts of flavor in return. If I could get more flavor, it would be worth the toughness. Perhaps complicating the toughness is that these pieces are cut with the grain, instead of against. In other words, I have to pull off grains of meat, similar to like string cheese, and that's not an easy task to do with this jerky. I think it would make it easier to eat if the pieces were cut against the grain, though I'm not sure how that would affect the overall flavor. My recommended beer pairing for this, a raspberry or cherry lambic. Agreed about this brand, it's super tough. There online ordering site is now dead. I am the president of Original Cattaneo Bros. Beef Jerky and Sausage Company in San Luis Obispo, CA. I am one of the four Kaney kids that still runs the family business today. My parents, Mike and Jayne Kaney took over the business over 20 years from the Cattaneo's. My parents were honored to take over such a great family tradition. The tradition and heritage of Cattaneo Bros. is near and dear to all of us here. We are proud to offer the same quality of beef jerky and sausage that originated over 64 years ago. The same trade secrets, recipes and attention to detail in the production process is still used in every batch that we make. With the launch of our new website in Fall 2009, we are excited about the new look and updated shopping cart that allows our customers to shop in the comfort of their own home! Log on to www.cattaneobros.com and experience for yourself the tradition. Also if your travels lead you to the Central Coast be sure to stop by the original Cattaneo Bros' factory to see how its is made and sample a taste! I think Cattaneo Bros. Beef Jerky is amazing... I wish it was found in more stores. I have to order it on their website, and I'd probably order more if it wasn't for the shipping costs. Good stuff... highly recommend if you want a tasty beef jerky without sugar/carbs.